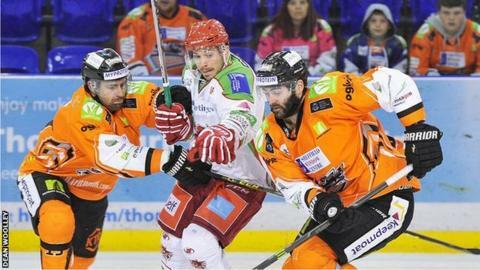 Cardiff Devils missed out on a chance to go top of Ice Hockey's Elite League when they were beaten 2-1 at Sheffield. Home goal-minder Marek Pinc kept a clean sheet until the 58th minute to frustrate the visitors. Jonathan Phillips and Levi Nelson were on target for Steelers with Carl Hudson replying for the Devils with 1:58 left on the clock. They teams face off again on Saturday in Cardiff (19:00 GMT) before the Devils travel to Dundee on Sunday. The key sequence in the match came in the second period when Steelers' Zach Fitzgerald was given a match penalty for hitting Andrew Lord from behind. Devils were awarded a five-minute powerplay, but were unable to score and saw the home team find the net within seconds of getting back to full strength.